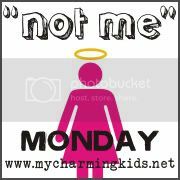 Welcome to another Not Me Monday! I most certainly did NOT respond to my husband's comment on our pork chops by screeching "Then cook them yourself!" Nope, not me. I'm would always respond respectfully! In the battle of the ficus tree. I was not standing over the stove this morning trying to figure out why the eggs were cooking so slowly, only to discover that I had turned the wrong burner off when the sausage was done. This did not happen because I stayed up too late last night reading a great book by Karen Kingsbury. I always start out the week well rested! !